Join Us In Celebrating Latino Culture! 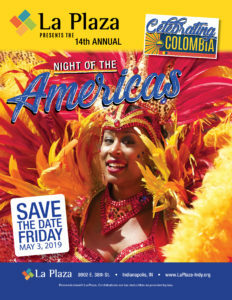 Since 1980, La Plaza’s FIESTA Indianapolis has been the premier celebration of Latino culture in Indiana, bringing together a vibrant and diverse community and enhancing the cultural fabric of Indianapolis. Over 15,000 Hoosiers join the FIESTA celebration every year, where they enjoy a full day of music, dancing, food, children’s activities, a health and wellness fair, and community service booths. This free, family event is held on the third Saturday of September at the American Legion Mall in downtown Indianapolis. Find Directions Here. Every Spring, La Plaza hosts our unique Night of the Americas event to raise community awareness and support for La Plaza’s impactful programs. During this Latin American themed evening celebration, over 400 of our city’s business, public, and community leaders learn more about La Plaza’s work, savor a delicious ethic dinner, and enjoy dancing under the stars. The students and families served by La Plaza have a chance to share their stories with the community. Finally, La Plaza names the annual Hispanic American Service Award winners and awards annual college scholarships through the La Plaza Scholarship Fund.